Bundesliga | Germany's class of 2009 - where are they now? Germany's class of 2009 - where are they now? It is a fact that almost beggars belief, yet Germany’s UEFA European Under-21 Championship success in Poland on Friday represented only the second time the country lifted the continental title at that age level. Some eight years on from their maiden Under-21 success in Sweden, we look back at the stars who featured for Germany in the 4-0 final win against England in Malmo, and how their careers have developed since then. Then: Ever present for Schalke in the lead up to the 2009 finals - making 50 appearances in the 2008/09 Bundesliga season – Neuer won his first senior international cap under Joachim Löw before heading to the Under-21 tournament. He conceded just once throughout the competition and kept a clean sheet in the Malmo showpiece as Germany swept England aside. Now: Arguably the world’s best No.1 and one of the game’s most decorated players, Neuer added the 2014 FIFA World Cup to his Under-21 winners’ medal at international level. Since signing for Bayern Munich in 2011, the 31-year-old has picked up a plethora of individual gongs to go with his five Bundesliga, three DFB Cup and UEFA Champions League prizes. Then: A fringe player in Stuttgart’s 2007 Bundesliga title-winning success, the Russian-born Beck moved to Hoffenheim – for whom he would make 216 appearances – shortly before the 2009 finals. The defender scored Germany’s winner in the 1-0 semi-final triumph against Italy. Now: Beck joined Besiktas in 2015 and has since enjoyed two domestic championship wins with the Turkish giants. Then: After coming through the ranks of Germany’s various youth teams, the Schalke defender was ever-present in his country’s 2009 Under-21 success, even scoring in the 2-0 group stage triumph against Finland. Now: Captain of the Royal Blues, Höwedes boasts a handsome collection of 12 goals in 240 games for the Gelsenkirchen giants and was one of only three players - alongside Neuer and Philipp Lahm - to play every minute of Germany’s 2014 FIFA World Cup success. Then: Höwedes’s partner at the heart of Germany’s back four, Boateng had just enjoyed a run to the UEFA Cup semi-finals with Hamburg prior to joining up with his international team-mates. His reputation as a tough-tackling, physical powerhouse was cemented with eight Bundesliga bookings for the Red Shorts in 2008/09. Now: The Hertha Berlin youth product is a current Bayern behemoth, having signed for the Bavarians from Manchester City in 2011. Like Neuer, Boateng has been part of Bayern’s unprecedented five successive Bundesliga wins and has also enjoyed DFB Cup and Champions League success with the current German champions. Then: HSV and Boateng lost out on a place in the 2009 UEFA Cup final following defeat to Boenisch’s Werder Bremen at the semi-final stage. A subsequent loss in the showpiece to Shakhtar Donetsk was quickly forgotten by the River Islanders, who won the DFB Cup prior to Boenisch’s teaming up with his Germany colleagues. A former team-mate of Mesut Özil at Werder, the Poland-born left-back later went on to make 60 Bundesliga appearances for Bayer Leverkusen. Now: After Under-21 success with Germany, Boenisch changed allegiances to Poland and went on to feature for the country of his birth at EURO 2012. Following a career beset by injuries, the 30-year-old is currently on the books at 1860 Munich. Then: Initially signed on loan by Borussia Dortmund from Bayern in 2008/09, Hummels was injured during the campaign but recovered to play his first minutes of Germany’s Under-21 tournament in the closing stages of the semi-final win against Italy. Suitably impressed by what he saw, coach Horst Hrubesch thus handed the North Rhine-Westphalia-native a defensive midfield role in his 4-1-4-1 final formation. Now: After Hummels’ move to Dortmund was made permanent, the centre-back rose to global fame at BVB, where he enjoyed Bundesliga and DFB Cup glory. Now back at Bayern, the 28-year-old – who recently added the 2016/17 Bundesliga title to his impressive title haul - is considered one of the world’s greatest defenders. Watch: Bayern make it five straight Bundesliga wins - the season in review! Then: Germany’s loss is currently the USMNT’s gain, but the Under-21s still managed to have the right-sided attacker at his pacey best in 2009. Then coming to the end of his time at 1860 Munich, Johnson – like Hummels – played in the semi-final and final as Germany chalked up their first-ever Under 21 triumph. Now: The son to an American father and a German-Amercian mother, Johnson – who is heading into his fourth season at Borussia Mönchengladbach – received a phone call from former USMNT coach Jurgen Klinsmann in 2011 and has since gone on to represent the Stars & Stripes 56 times. Then: Experienced central midfielder Castro amassed an astonishing 107 Bundesliga appearances for Bayer Leverkusen prior to the 2009 finals and had previously appeared at the Under-21 showpiece event in 2006. Having suffered DFB Cup final heartache against Werder Bremen before making the trip to Sweden, Castro scored in the ’09 final to take his tournament tally against vanquished opponents England to two, adding to his strike in the teams’ 1-1 group stage draw. Now: Despite winning just five senior caps for Germany since, Castro has become an important squad member for Dortmund – the club he joined in 2015 – and recently lifted the 2017 DFB Cup alongside his Die Schwarzgelben team-mates. Then: Germany’s captain made 22 appearances in Stuttgart’s 2007 Bundesliga-winning season and having later gained Champions League experience playing against the likes of Barcelona, the midfielder arrived in Sweden with the adequate know-how to lead his nation to glory. Now: Khedira departed Stuttgart for Real Madrid and during five seasons in the Spanish capital he won Liga and Champions League honours. The holding midfielder – another of the 2014 FIFA World Cup winning cast – recently celebrated his second league and cup double with Juventus. Then: A player who became an assist king at Werder following his move from Schalke, Özil scored the winning goal in the 2009 DFB Cup final in the run up to Sweden ’09. Setting up 15 Bundesliga goals that season warmed the attack-minded player up in timely fashion for Germany’s assault on the trophy and he was named man-of-the-match in a goalscoring appearance in the final against England. Now: Özil joined his international team-mate and fellow World Cup winner Khedira at Real Madrid, winning the Spanish league in 2012 while he has been a mainstay at Arsenal since 2013, racking up 23 goals in 116 Premier League appearances. Then: A striker of some repute at Bundesliga 2 outfit Duisburg in 2009, Wagner only managed a full 90 minutes at that summer’s Under-21 finals, which he saved for the showpiece, scoring twice for Germany late on to sweeten the scoreboard for the victors. Now: Following his final feat, the Munich-native could not have predicted he would be waiting almost ten years for a first senior cap. Yet after spells with Werder, Kaiserslautern, Hertha Berlin and Darmstadt, it was Wagner’s role in Hoffenheim’s remarkable 2016/17 campaign that led to a call up by senior coach Löw in June. A hat-trick in his second appearance in a World Cup qualifier against San Marino helped Wagner bridge the international scoring gap. Then: Coming to the end of his first season at Hamburg, defender Aogo played in all five of Germany’s games at the 2009 finals. Now: The former Freiburg youth-team player most recently helped Schalke to reach the quarter-finals of last season’s UEFA Europa League. Then: Another of those to have emerged at Freiburg, defender Schwaab was given 21 minutes to shine against England when brought on to replace Johnson as Germany looked to tighten up in the title decider. Now: Despite an injury-blighted career, the Waldkirch-born Schwaab is at present part of PSV Eindhoven’s plans, having previously represented Bayer Leverkusen and Stuttgart. 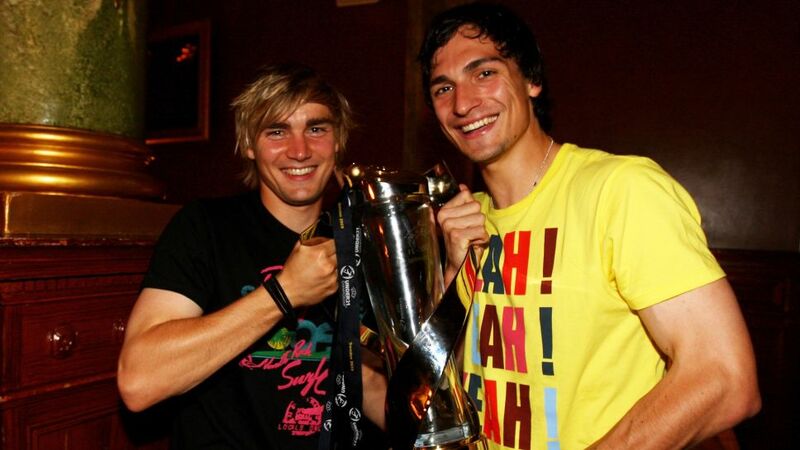 Then: Already very much a part of Dortmund’s first team, Schmelzer played 135 minutes of Germany’s 2009 campaign in Sweden, and was brought on in the final minute of the final against England. Now: BVB through and through, left-back Schmelzer has become club captain with two Bundesliga and two DFB Cup titles to his name.